Our preferred payment method is Direct Debit. Alternatively, call us during standard NZ business hours on 0800 500 450 from NZ or +64 9 580 7365 from overseas to set up a direct debit. Specific Conditions relating to notices and disputes for direct debit payments. You can transfer payments directly through your bank's internet banking to make a bill payment or schedule an automatic payment. 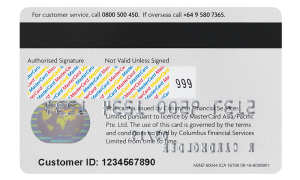 By choosing Flight Centre Mastercard as the payee you will be prompted to enter your Particulars and Reference we need to process your payment. Once you have entered all your details you are then also set up for future payments. To avoid unnecessary delays to your payment please ensure you always complete the Reference field as above. For any questions relating to payments, please click our Help page. You'll find it on the back of your card as per below.